Black is, of course, a symbol of death (that is, in Western Civilization). Certainly, other colors have also been used to represent death – even green! Still, for the most part, black is the traditional symbol of death in Western culture, and this still holds today. In the Western world, everybody wears black to a funeral … except the priest, and he often wears white! Black does not signify despair, not at all. Rather, black is the symbol of mourning, of loss, of death – but this mourning will be turned to joy, the loss is great gain, and death is birth unto true life. The color black is in no way contrary to Christian hope. It is worth noting that – although, in the early days of the Church, white seems to have been the color of vestments on every day of the year – black was almost certainly introduced into the liturgy before violet (purple). In fact, it seems that black came to be used as one of the (originally) four principal colors of the Mass: White, green, red, and black. Considering the antiquity of the color, it is somewhat surprising that black is used far less often today than is violet – while many Catholics have seen violet used (in Advent and Lent), nearly an whole generation has never seen a black vestment (at least in the USA). Traditionally, black is used at all Masses of the dead and funeral Masses, on All Soul’s Day, and on Good Friday. In the Novus Ordo, black is not to be used on Good Friday, but may still be used at the other Masses (though violet and even white are also permitted, and in practice preferred). There is no reason why a priest could not, in the Novus Ordo begin to use black vestments at least for All Soul’s day – and even for funerals and Requiem Masses. However, violet directs us more to mourning for our own sins, and to performing penance for our own wretchedness. Black, on the other hand, helps to direct us to mourn not for ourselves but for the deceased. This is why black is so fitting for the funeral Mass (as well as Requiems and All Souls’): The color reminds us to pray for the dead. Consider, as a test case, the recent feasts of All Saints’ and All Souls’ days. In many (perhaps most) parishes throughout the USA, the faithful saw the priest wear the very same vestment for All Souls’ day as he did for All Saints’. What sort of theology does this communicate to the people? Considering the essential difference in the character of the Masses of All Saints’ and All Souls’, it is a scandal (yes, a scandal) that white is the most common color de facto for All Soul’s day. However, sadly, the use of white is by no means a liturgical or rubrical violation. Even in the typical parish of the USA, there is ample opportunity to re-introduce black into the liturgy. Certainly, parish priests simply must begin to wear black vestments for All Souls’ day – there is no excuse for not wearing black, at least on this day. Further, it would be very good to use black also for all funeral Masses. Additionally, it would be worthwhile for the parish priest to begin to offer Requiem Masses more often. The Novus Ordo has relatively few memorials and saint days (compared to the Extraordinary Form), thus there are many more opportunities to offer the votive Mass of the dead throughout the week. Certainly, the Requiem can only be offered if the Mass intention is for one of the deceased, but it shouldn’t be too hard for a parish priest to plan his Mass stipends around the liturgical calendar so as to maximize the number of Requiem Masses. If the typical parish began to celebrate Requiem Masses on all (or most) of the ferial days when there is no saint to be commemorated, then it would be very easy for the parish priest to use black vestments at least once per week in the Novus Ordo parish Mass. Speaking from my own limited personal experience as a parish priest, I have committed myself to using only black vestments for funeral Masses, and all votive Masses of the dead. So far the response has been very positive. Still, it will not be particularly helpful to anyone for the laity to begin to harass liberal priests about wearing black. Rather, we must all pray and fast for a restoration of the priesthood to the tradition of Faith. For further reading, may I suggest two articles from the New Liturgical Movement? - here and here. Amen. Amen. Amen. Kudos, Father. You are spot on. I went to Mass this AM and after the Mass, this particular Priest, as he always does, told a few jokes after Mass as I quietly was exiting the Church. Green Vestments and Jokes and never a mention of the Plenary Indulgences that can be gained and applied to the Church Suffering these first eight days of November during which time one can visit a Cemetery and pray for one's dead family members. It is absolutely appalling the way Holy Mother Church ignores its entire Ecclesiastical and Liturgical Tradition, especially during the month of November , and its present praxis puts the lie to any claims of continuity. We are living in a time of radical rupture.
" Dear Father, how were you ever allowed to sneak through the Seminary? :) "
Surely, I owe it to the prayers of those devout faithful who have persevered through these years of chaos. Though I would love to see a return of black vestments here in the UK (only to be seen in Anglican sacristies, and various abbeys and priories at the moment), I'm not hopeful. As has been noted over at Chant Café regarding the Propers, when you give people options, but don't spell out an order of preference, people will always choose what's easiest. In this case, a lot of black vestments must have been ditched in the 1970's (I'm one of that generation which has never seen them in use), and replacing them is expensive. At least priests here wear the somber violet instead of the festive white on such occasions, except perhaps for an infant's funeral. Anyone know anywhere we can pick up a decent black Mass set? On the other front, it is just not seen as “pastoral” any more. Funerals are now often “celebrations of life”, to dare suggest one has to pray for their dearly departed loved ones in order to expiate temporal punishment due to sin (let alone that they might not be in Purgatory, or Heaven…) would be an “insult” and harsh. The whole issue is a microcosm of what is wrong with the priesthood and the Church. Many from “that generation” really to see themselves implicitly (if not almost outright) as Protestant ministers and not as the sacerdos of Catholicism. They are there to foster cultural rites of passage and the looking-respectable “traditions”, to facilitate happy-funtime worship, to make people feel good about themselves and to keep the Corporation churning. Something like black at funerals does not support this sort of outlook (or any version of the progressivist program). It makes people actually take a look at their lives and mortality and might get them actually pondering the things of eternity. I think that the average pewsitter might get miffed if the priest wore black, as that would signify, in their minds, that whomever it is that has died did not go straight to heaven. In the "Liturgical Year", I was surprised to read that funerals used to be quite joyous occasions way back when. Finally, I understood why the tone of funeral Masses changed post Vatican II. However, when all is said and done, I want a Requiem Mass said when I die. Now, I just have to hope that our diocese will have a priest who will be able to say one when my time comes! I just got an idea! Fr. Ryan, YOU can come and say my Requiem Mass!!! I am not very far from you...two states to the west. Very inexpensive (but nice looking, if low quality) vestments can be purchased through catholicliturgicals.com ... for around or less than $100, plus shipping from India. Mind you, they are not particularly high quality, but they certainly look much nicer than most of the vestments in parish churches these days. "Even in the typical parish of the USA, there is ample opportunity to re-introduce black into the liturgy. Certainly, parish priests simply must begin to wear black vestments for All Souls’ day – there is no excuse for not wearing black, at least on this day. Further, it would be very good to use black also for all funeral Masses." I presume that you would not wear black either for a person who has not yet achieved the age of reason or who is "non sui compos" but would follow the custom of wearing white in that case. Also, I think that a case can be made for violet, even if it is not my preference. It certainly is penitential. It is also used in the EF for Votive Masses of the Passion and on ember days and rogation days. I thought I'd share my own experience. In my first assignment, the pastor was given a very nice chasuble and stole by the parishioners. I think he felt as though I had been overlooked, so he offered that the parish would buy me a set as well, whatever I wished. I good friend of mine helped me in looking through some options, and when I noted how beautiful one of the sets was, and especially the black, she told me, "get it, you'll not likely come across them" in whatever parish I might serve. Well, I did, and BEFORE I HAD EVER CELEBRATED MASS IN THEM, the pastor complained to the bishop, who hauled me in for a meeting. He acknowledged they were permitted but asked that I never use them without the permission of the pastor. I reasoned that his purchase of them for me was all the permission I required, and wore them for a commemoration of the dead. People liked them, and I have used them these 12 years. I wear them a few times a year and I have been considering them for funerals. It's the old "lex orandi, lex credendi" all over again! Thank you for an excellent article. Our Holy Mother the Church in Her wisdom early on, as you tell us, selected a color, black, to indicate mourning for the dead faithful. It signifies the Tomb, and Purgatory, from which we will be released at the end of our satisfaction of the temporal punishment due for our sins, and our purification, and perfection in Charity. We can now assist our dead through our suffrages and good works. Especially through our assisting at the Perfect Prayer, the Mass. By restoring the color and the requiem liturgy to correct and common use, we will do much to restore our belief in the power of prayer for the release of the dead from purgatory, and indeed that there IS a Purgatory, and that it's a great thing to get there. Right liturgy concentrates the mind and the imagination to will to do good! Even the message of a satisfactory homily can be completely missed if the liturgy is all over the place, as you so well describe. Thank you and God bless you, Father. For a baptized child (prior to the use of reason) or for a baptized person who is 'non sui compos' (i.e. has never had the use of reason) ... I would use white ... indeed, the tradition is very strong on this point: They are already in heaven and have no need of our prayers. For a non-baptized young child (prior to the use of reason), I would probably use black ... though we are not praying for them, we are still mourning ... and we do not really know that they are in heaven (personally, and following the tradition, I am quite certain that they are not in heaven but are in limbo). "but don't spell out an order of preference, people will always choose what's easiest"
In some (if not all) cases, people will do what is easiest even when there is an order of preference. Exactly, even when there is an "order of preferences" people still go the easiest/their preferred route. That is why there shouldn't be all these options. In the old Mass, black was proscribed for Requiems and Masses for the Dead (except 130 d in the rubrics). If they wanted to be more "inculturated" for lands that saw white or something else as a mourning color instead of black they needed to spell that out specifically with a special indult only for those lands and no options for anywhere else (least of all Europe and America). the comment by Dominic should read, "In the old Mass, black was PREscribed for Requiems" (i.e. it was mandatory, not forbidden). And, yes, I certainly agree that the manifold options create confusion which tends to descend to chaos. Exactly. Bad typo that makes the word mean the exact opposite of what I wanted to say! As for violet, it was used in Requiem Masses before 1962, under certain circumstances. It was (and is in the EF) used in some places, e.g., when Holy Mass was offered in the presence of the exposed Blessed Sacrament. Also, while I still agree about the use of black, the argument can at least be made that black is an innovation. In the time of St. Jerome, only one color was used for all Masses--white. If black can be an innovation that was accepted in time, can violet or white not now be an innovation that is accepted, especially if viewed as the more ancient custom? Thoughts? Well, black is no more an "innovation" than green or red. Yes, it is true (as you rightly point out) that these things can indeed change ... still, I have attempted to show in my article why, for pastoral reasons, it is very important that we regain and maintain the use of black. However, I would point out that black is more ancient than violet ... the first four colors were white, then red, black and green ... violet came shortly later. In any case, I am not one of those that likes the idea of gowing back to the most ancient customs, rather I affirm that the liturgy is living and organic ... and the movement from white to black was organic, but the movement from black back to white has been anything but organic. It was (and is in the EF) used in some places, e.g., when Holy Mass was offered in the presence of the exposed Blessed Sacrament. I don't think I've ever seen violet vestments used for the Missa coram Sanctissimo. A very interesting blog spoiled by the use of the outrageous term "Extraordinary" to describe the Traditional Latin Mass. The only thing "extraordinary" about it is that it has survivied every Modernist attempt to suppress it. And yes, I know that the Holy Father used this term but that only makes it all the more outrageous. Your comment is an excellent example of why the traditional crowd continues to be suspect to priests and bishops everywhere. So long as people like you continue to be so abrasive, black vestments (and the other ancient traditions) will be looked upon as radical and extremist. By the way, what is "extraordinary" about the usus antiquior is that it is not the norm - neither in practice nor in law. The novus ordo missae is the ordinary form - both in practice and in law. End of story ... at least for now ... though we can certainly hope that this will change! With respect, Father, I do not consider myself part of any "traditional crowd." If you recall, one of the first things the new Pope noted in a public speech is that only those Catholics who adhere to the whole of the traditional Catholic Faith are "suspect" (I'm not quoting verbatim, obviously, but you'll remember the address to which I refer). Who would have thought that it would be considered "abrasive" to say what I have no doubt each and every pope prior to Vatican II would have said about the outrageous fact that a new (and getting newer by the day) Mass could replace the ancient Mass and the latter be consigned to being an "extraordinary" event in the life of the Church. As to legality - where I live, our wonderful "hardline" bishops told us for years that the ancient Mass was now forbidden and we had to accept the bew "fabricated, banal, on the spot production" (quoting Cardinal Ratzinger) or lump it. Contrary to your assertion about legality, the legal status of the novus ordo is highly questionable indeed. Pope Paul VI himself said (rather too late in the day) that he had only intended it to be an option. Well after many years of suffering it, I've opted out. Legal? It will never be legal in the eyes of God to force any Catholic to participate in anything poisonous to his/her Faith. Finally, please rest assured that an avalanche of those of us now labelled "traditional" (whereas the very hallmark of a Catholic is to adhere to Tradition) would not affect, in the slightest, any of the diocesan priests and bishops mentioned in your reply to me. These same priests and bishops will continue to oppose the old rite Mass and black vestments and Communion on the tongue and everything else that smacks of Catholicism for the simple reason that they hate the Faith. That is why they tolerate and even promote dissent in their parishes and dioceses. Not because an insignificant lassie like me is "abrasive" - if only I had that much influence! If only you spent as much energy defending the Christological doctrines of the Church ... as it is, you obsess over changes in things that really can change (like the rites of the Mass). By the way, it is poor form when you cite Ratzinger as an authority when you have just discredited him as a Pope. In any case, you are correct, the lay faithful have a right to participate in the more ancient usage of the Mass ... I myself celebrate that Mass often (and I it is my own personal preference by far). Yes, the Novus Ordo is banal and fabricated ... but it is still the ordinary form (for now). Also, I did not mean to say that you are in the "traditional crowd" ... I would hope to consider myself part of the "traditional crowd" (not only liturgically, but also spiritually and theologically) - and you are giving us a bad name when a single word ("extraordinary") leads you to say that an entire blog is "spoiled". 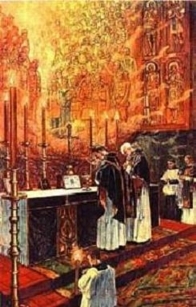 A related issue is the use of the Alleluia at funeral Masses. This innovation parallels the change of colour of vestments following Vatican II. In the West, the Alleluia was admitted into the Mass before the Gospel somewhat reluctantly, and when it was it was done so with limitations. It was used only for occasions of joy, or rather, it was not admitted for occasions of sorrow and penance. The more ancient Tracts continued to be used for the latter occasions. You bring up a very good point ... at my Masses this past All Souls', the Alleluia was omitted. Also, it is good to note that the tract is still permissible ... indeed, priests should most assuredly try to incorporate this into Advent and Lent (at least)! I haven't noticed anyone attacking Christological doctrines here or I would certainly have expended energy in defending those. for an entire week (last week) we had a video and two reports about the 5,000 strong march of French Catholics protesting a blasphemous play about Christ (which didn't merit a mention on the UK news at all) on our website so I can't help wondering why you would say that about me. Again, it is debateable whether it is legitimate to change the rites of Mass, as you say; certainly the anathema in Session VII of the Council of Trent suggests otherwise. And never before in the history of the Church has anything been removed from the Mass - prayers added, yes, but never the surgery that took place in the Bugnini Mass. I made the point that the use of the term "Extraordinary" (like the use of "Blessed" before Pope John Paul II's name) betrays a post-Vatican II mentality. Both of these terms reflect the crisis in the Church where, e.g. modern Catholics think Pope John Paul II was "great" and is in heaven, despite the fact that after a massively lengthy pontificate he left the Church in the worst of conditions. I think it is more charitable to include him in the prayers for the Holy Souls, which is what I am doing rather than assume he is in heaven. Since beatification is not an infallible act, we are perfectly at liberty to do so. I don't meant to take this discussion off at another tangent but am merely using this as an illustration of why I object to these terms. It is, indeed, puzzling when alleged "traditional" Catholics use these terms (extraordinary and blessed) in today's crisis circumstances but then I'm a simple gal! Finally, I did not mean that the use of the term "extraordinary" spoiled the whole blog - I meant only that I had enjoyed reading everything and was very pleased with the article (I've actually posted a link to your other excellent article about indulgences on the Catholic Truth website) but there is no question about it, those who use these terms are not to be found in truly traditional circles - by which I mean Catholics who only attend the Traditional Mass and reject the errors that have emanated from Vatican II. Those who keep a foot in both camps do use these terms and it is one of the ways, I have found, that allows me distinguish between these post-Vatican II groupings where once we had only "Catholics" - very sad. I quoted Cardinal Ratzinger's own words about the Mass being banal etc. because he said them. He was Head of the CDF at the time. Admittedly there is a contradition in what he says compared to what he does (he said that same "banal on the spot production" himself for many years) but that's the crisis for you - confusion and chaos everywhere, including at the highest level. Anyway, thank you, Father, for posting my comments. I try to avoid moderated blogs since they tend to heavily censor "views" like mine, so I appreciate your fairness in publishing my comments in full - so far! You are incapable of following a line of reasoning ... constantly bringing in periphery issues ... saying things which are offensive to pious ears. I am surprised that you are so insistent on the fact that the canonization process is not infallible (indeed, it not) ... I wonder, do you insist upon this point with equal "zeal" when people speak of St. Philomena? Or St. Veronica? As far as John Paul II, to me he is a saint. In any case, the crisis and confusion is not that hard for me to deal with ... because I stand in union with the Church ... you, on the other hand, are on the very edge of unity - it is a dangerous place to be. You have the crisis, because you write as though there is such a thing as "pre" and "post" Vatican II Churches ... I almost wonder if you think that Jesus founded two Churches, rather than one ... certainly, you have a stronger hermeneutic of rupture than any liberal I have ever met (after all, I don't know of any liberal Catholic who seriously thinks that Pius X or Leo the Great are not saints, simply because they came before Vatican II). Regarding censorship ... I did not censor your last post ... but I will not allow another of equal length ... you must learn to respond to the issue and succinctly. I did not say that canonizations are not infallible - they are infallible acts. I said there was no guarantee of infallibility with beatifications. And with respect, nobody can "stand in union with the Church" who rejects the teachings of every pope prior to the Second Vatican Council. Vatican II caused a break with Tradition in several areas, notably the sort of ecumenical activity now commonplace in the Church but which was strictly forbidden by every pope in history before the Vatican II popes. As for the division between the pre-and post Vatican II Church - once again Cardinal Ratzinger said that. He pointed out that today people were interpreting the Council as a new start from zero. You can't blame me for saying something that is self-evident, the subject of articles, books, blogs, letters in the Catholic press and was identified and condemned by the current pope. Be fair! However, it is clear that you are annoyed with me daring to speak out "abrasively" against the Modernism thriving in the Church today, and so I will desist from bothering you again. Those who try to keep a foot in both camps are seldom happy when confronted with "the traditional crowd." Apologies for disturbing the peace! It is one thing to criticize the things which took place after Vatican II, and it is even permissible to criticize and question certain points from the Council itself ... but your radical division between the pre Vatican II and post Vatican II Churches is unacceptable ... Ratzinger was lamenting the fact that people make such a distinction, he wasn't affirming it! You are, ultimately, not much different from the liberals -- they reject the "pre Vatcian" Church, you reject the "post Vatican" Church; but both of you see Vatican II as a complete watershed and a whole new start. If you truly are representative of the "Catholic Truth" movement ... then I have little hope for any fruits there. Earlier, I had allowed a comment from one "Athanasius" to be posted, in which he spread terrible libel against Blessed John Paul II ... I should not have allowed that comment, and I apologize for that. However, to speak to the question directly: Some extremists will point to a particular incident wherein the Holy Father John Paul II made an act of reverence toward the Koran (kissing it). Of course this is a bit difficult to understand at first. b) Really believed in what Islam taught (that there is no Trinity or Incarnation). Now, such critics are fools for thinking such things, and wicked for sharing these thoughts. No honest person could doubt at least this much: John Paul II believed in the most fundamental doctrines of Christianity, he believed in the Trinity and the Incarnation. It is one thing to criticize certain things about his approach to the Mass ... or other subjects ... but to question whether he was a Christian?! This is libel! This is wicked, foolish, speech ... and it does not deserve a hearing either here (at NTM) or anywhere. That is why the comments by "Athanasius" have been deleted. Since I believe the original topic on this thread was the use of black vestments, I would simply like to point out that in the Ordinary Form black vestments remain an option for All Souls Day and Requiem Masses. Indeed, several parishes in my archdiocese use black on All Souls Day. As an altar boy in the '70s at a parish that implemented the Pauline Missal faithfully, I remember serving Mass on All Souls Day with the priest in Violet vestments (which the ordo in the Sacristy indicated was the intended first choice). There are many things people think were "abolished" in the liturgical reforms (like "ad orentiem" celebration, the "Dies Irae", and black vestments) that in fact, never were. They've simply been ignored or illicitly laid in abeyance by dissident clerics and their parochial minions. Criticism of the Ordinary Form is fine, provided the critiques are factually-based. Yes, indeed - in my parish also, black is a common color (used a couple times each month). However, I must note that the Dies Irae has been removed from the Novus Ordo ... I know of no occasion where it can be licitly used (at least not as a sequence) ... perhaps it could be stuck in as a "hymn" during a funeral Mass - but this would be quite odd. "The Dies irae is not forbidden in Masses with the Novus Ordo, it simply is no longer obligatory. The Church’s documentation on the use of sacred music establishes that suitable (i.e., truly sacred and truly artistic) pieces can be substituted into the Mass for the proper purpose and occasion. Nothing is more suitable for Catholic piety than the use of the Dies irae." "SM: What if the family of a deceased person requested the sequence Dies Irae in the new form. Would you comply? We would incorporate it. There are many opportunities for music in the ordinary form of the Mass, and people have a choice. The Dies Irae is beautiful and appropriate. Many times, people don’t realize that it is there and when they do realize it, they are not sure that it is allowed. So there are ways in which the two-form setting here at St. John Cantius fills out the details." "It is noteworthy that a parish like St. Etheldreda's, an established witness to the dignity, beauty and holiness of the Church's living tradition, sings the Dies Irae sequence for requiem Masses on a regular basis." Fr. Z regularly pushes the limits with regard to incorporating the Traditional Mass into the Novus Ordo ... another example would be the use of the maniple (he says it is ok because it is not specifically forbidden ... I say that the rubrics tell us what we should wear, not what we should not wear). Now, I have no problem with using the maniple ... but I just don't see it in the rubrics (it's in the tradition, but not the rubrics). If the rubrics are silent, we cannot just do what we want ... and there is nothing in the rubrics to justify the use of a sequence (really a hymn) after the Gospel during the funeral Mass of the Novus Ordo. Even in Fr. Z's own words ... it says that other pieces of music can be "substituted" ... this is different from simply adding. Substituting means removing one thing and replacing ... but there is no sequence to remove in the Novus Ordo Funeral, it would simply be adding to introduce the Dies Irae. Still, different priests will have different pastoral sensibilities ... I myself would be pretty open to using the Dies Irae (especially at the request of the family), but I really don't see any justification in the rubrics. Thanks for the quick response! This is something i've wondered about for a long time. I knew it (dies irae) wasn't in the rubrics. "Music from the traditional Requiem Mass may also be used. The chant settings of the Dies Irae, Requiem Aeternam and In Paradisum are in the Adoremus Hymnal 577, 574, and 572 respectively. [The Dies Irae, no longer the required Sequence hymn before the Gospel at a Requiem Mass, might now be chanted before Mass begins. — Ed.]" I see you are from the diocese where I grew up. I'm happy you would be open to using the Dies Irae for a funeral. In our parish, all the Masses during the month of November are offered for the Faithful Departed except Sunday Mass pro populo. We would vest in black unless there's a solemnity, feast, or obligatory memorial. As a communicant in the ELCA, black, until the introduction of the Evangelical Lutheran Worship hymnal, was used only for Ash Wednesday, symbolizing our "death" in the eyes of the Lord by the Original Sin. As a seminarian in the Independent Lutheran Diocese, our Divine Service (Mass) on Ash Wednesday calls for black, as well as the Daily Office on Good Friday (or a black pulpit robe), while the Service of Humility, our version of All Souls', requires us to remind ourselves that we are all sinners, and that accepting Christ as Saviour MAY lead to everlasting life in Heaven. Just to let you know that I'm currently studying for the ordained ministry in the Independent Lutheran Diocese (although lately I'm thinking about switching to an independent Anglican body and like some Lutherans wanting to join the Anglican Church of North America, to do the same for this body, but styled like the Anglican Personal Ordinariates so that either a bishop or priest can run it), the ILD, like it larger cousin the Lutheran Church-Missouri Synod, calls for the wearing of black for Ash Wednesday and Good Friday and purple for vigils. As for someone who has been to Catholic funeral Masses (my father's side are Polish Catholic, and attend Masses at St. Hedwig's Chapel in Chester, PA or Sacred Heart-Clifton Heights), the use of white for funerals is an abomination. Whether as a Lutheran pastor in the ILD or as a priest in the independent Anglican body, I will not be ashamed to wear black (or purple) vesture for funerals and ask the Lamb of God, who took away our sins on the Cross, to grant that person eternal rest. I am a priest who recently lost a parent. I had previously used white vestments for funeral Masses (mainly because I was told to do so), but I have come to the conclusion that wearing white vestments at a funeral is extremely insensitive to the family of the deceased, most of whom are wearing black clothing and are in a state of mourning. It's tantamount to wearing a Hawaiian shirt to a wake. Wearing black vestments also reflects the fact that the Church shares the family's grief ("meeting them where they are at", so to speak). The promise of hope in eternal life is reflected most fully through the celebration of the Eucharist (the pledge of future glory, as Aquinas states) rather than through white-colored vestments.